James Renton: Does the World Really Need More Experts on Racism and anti-Semitism? In our current age of populism, the expert is much maligned. The UK government minister and Brexit champion Michael Gove famously declared in 2016 that “People in this country have had enough” of them. In the United States and on the world stage, Donald Trump’s presidency is the embodiment of anti-intellectualism. Shooting (quite literally) from the hip is the order of the day. The side-lining, or absence, of experts in public debate has been particularly marked in the furor over anti-Semitism and other racisms in the last few years. This is no coincidence; populism is a result and vehicle of multiple crises of racism around the world. We (the experts) must respond. As a big step in this direction, the European University Institute in Florence, Italy has launched an online magazine to bring academic expertise on racism to global public debate, collaborating with NGOs, policymakers, and public institutions such as museums…. 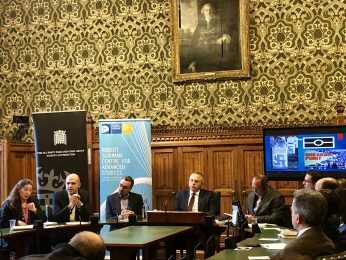 Earlier this year, our magazine co-organized with the All-Parliamentary Group Against Antisemitism an event at Westminster on anti-Jewish and anti-Muslim prejudice. The research briefing emphasised the complexities of how these two racisms have been connected (but also distinctive) over the last millennium. This research shows that focusing on only one racism in one political party in one country means missing a crucial context: a much bigger, inter-connected European and global picture of multiple racisms across political divisions. This is the sort of expertise that could change completely public debate, and it needs to be known. For all posts on our book Antisemitism and Islamophobia in Europe: A Shared Story? click here. In 2017, antisemitism and Islamophobia were, along with other racisms, on the rise around the world. In Charlottesville in the United States, far-right militants marched chanting against the world Jewish conspiracy. In Myanmar, Muslims fled for their lives to Bangladesh. In the UK and Europe, these racisms also continue to flourish. But are they connected? In the aftermath of 9/11, controversy has raged about whether Islamophobia is the new antisemitism. MONITOR chose this pressing issue for its first public event. The location: the UK’s Houses of Parliament, hosted by the All-Party Parliamentary Group Against Antisemitism. The magazine aims to bring cutting-edge research into global public debate, and this collaboration was the ideal place to start. The Editor, Monica Gonzalez Correa, flew in especially from Florence. Follow the Monitor YouTube channel.